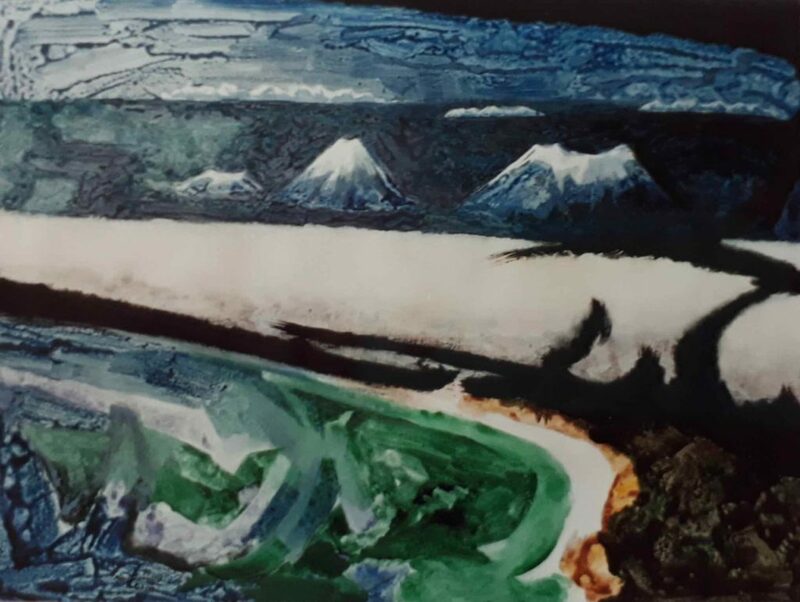 New Zealand expatriate painter Douglas MacDiarmid may have lived abroad for many decades yet his homeland has steadily grown in importance in his work in the latter years of his career. 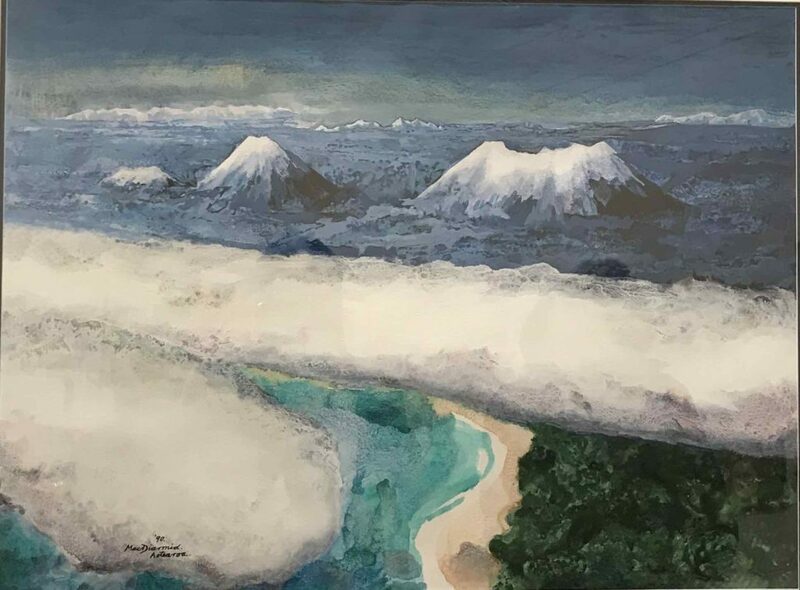 During 1990, while in New Zealand as an official government visitor for the 150th anniversary of the founding of the nation, he started a series of paintings called Aotearoa, inspired by the volcanoes of central North Island he saw from an aircraft while flying from Auckland to Wellington – with the ubiquitous long white cloud hugging the landscape. This trip was a turning point in MacDiarmid’s acceptance of the landscape of his homeland, and the strong influence it exerted on his life and art. 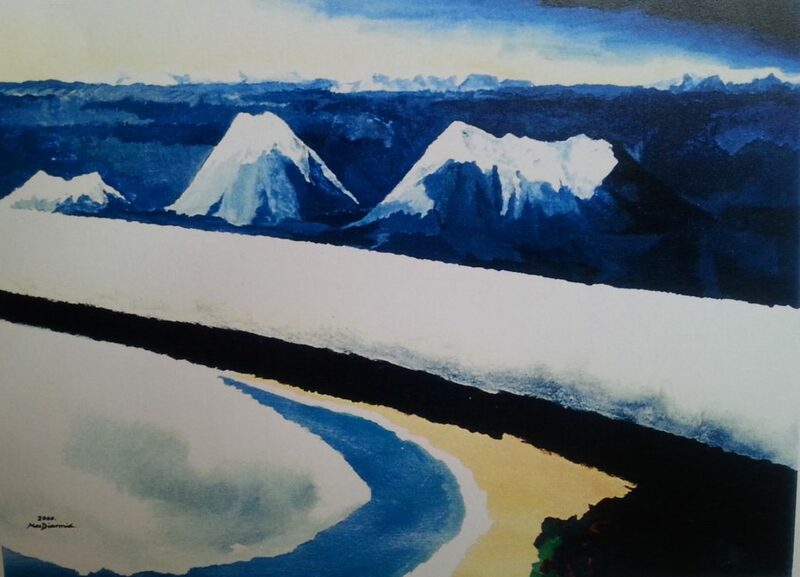 A number of powerful paintings of Ruapehu, Ngauruhoe and Tongarewa, from the air and the ground, as well as the rugged Rangitikei district around Taihape, emerged from MacDiarmid’s Paris studio as a result of this visit. 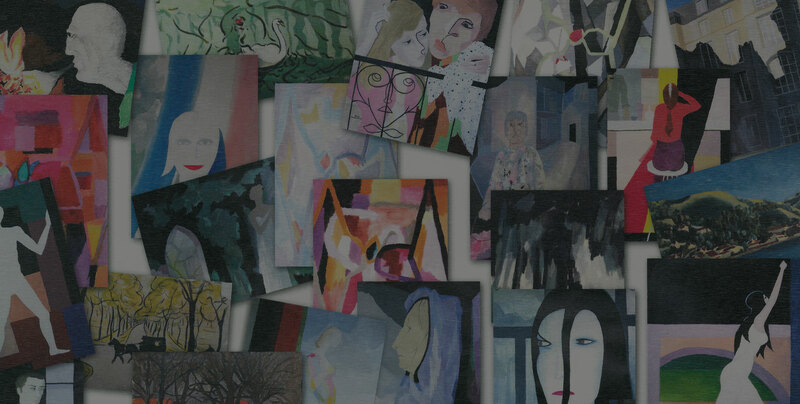 The striking series continued to take shape after his final trip to New Zealand in 1996, paintings found in expatriate collections as far afield as London and Europe. Aotearoa 1990 by Douglas MacDiarmid. Acrylic on paper 97x76cm. Private collection, New Zealand. The first in the series was Aotearoa 1990, which made a welcome appearance at the Auckland launch of the biography Colours of a Life: The life and times and Douglas MacDiarmid, at The Pah Homestead on 18 July 2018 – one of 18 paintings borrowed for the night from local collections and the Wallace Arts Trust. For those unfamiliar with the Māori name for New Zealand, Aotearoa means ‘Land of the Long White Cloud.’ From the volcanic wasteland of the Desert Road, on the main north-south highway, plumb in the middle of the island, the three active peaks that pierce that cloud bank have created this unforgiving but beautiful terrain. At every sighting they present a different face. Aotearoa II 1990 by Douglas MacDiarmid. Acrylic on handmade rag paper, 77x56cm. Private collection, New Zealand. Aotearoa III 2000 by Douglas MacDiarmid. Acrylic on paper, 76 x 56 cm. Private collection, Belgium. These volcanoes remind us that we live on a planet with a fiery core, and that New Zealand is a young country continuing to grow and change, in both geological and human terms. The two tectonic plates on which the country sits stretch and move, and the internal heat from the depths of the earth periodically issues to the surface through these chimneys, sometimes in violent explosions. Seen from the air again in 1996, the cones were calm in the shaky isles. Aotearoa 1990 featured in a one-night exhibition of works contributed by a circle of friends on 18th July 2018 at the Auckland launch of Douglas MacDiarmid’s biography, Colours of a Life: The life and times of Douglas MacDiarmid, written by his niece Anna Cahill and held at the The Pah Homestead, in collaboration with the Wallace Arts Trust. MacDiarmid’s biography is available to purchase here, at selected galleries or from all good bookstores throughout New Zealand.